Under the beautiful moonlight in Downtown Los Angeles, I strolled through Grand Park to see the various, dazzling altares/ofrendas set out in remembrance of lost relatives and ancestors. There was a display of fascinating, colorful calaveras painted on large wooden cutouts of traditional Día de los Muertos skulls. This captivating art installation took place on October 31st. 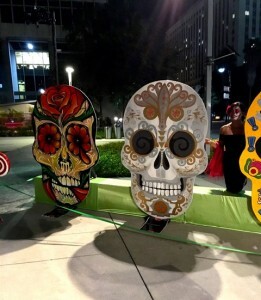 Extending four blocks, this Día de los Muertos exhibition allowed community members to experience the traditional, as well as modern day, ways of celebrating those who have passed and memorializing the past. It is a day in which the curtain between our two realms—of the real, present world and of the afterlife—is lifted and so that we may share the day. 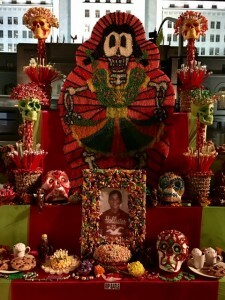 The Altares at Grand Park, held directly in front of City Hall, were decorated with various ofrendas, or offerings, both by the master altar makers of the exhibition as well as by community members. People were encouraged to bring photographs, write notes, and/or sign their names on some of the altares. Men and women dressed as catrinas/os visited the altares, dressed in traditional clothing with their faces elaborately painted. I made sure to write a special note to my godmother who I lost several years ago; as I wrote her name, I automatically felt in touch with not only her spirit, but also to my culture. The first altar I saw as I began my tour of the art exhibition was one dedicated to Trayvon Martin—a 17-year-old African-American male who was fatally shot and killed, yet received no justice for his murder. We see here the bridge between the Latinx community and African-American community, making a powerful statement of solidarity. The statement becomes even more effective as you look over the altar and see Los Angeles City Hall helping illuminate the already vibrant memorial. Ten elegantly designed calaveras, five to each side of the altar, were displayed to illustrate another important piece of the Día de los Muertos’ tradition. The calaveras have come to symbolize the revival of an individual into the next stage of life. One calavera, in particular, grasped my attention almost immediately. It was one representing Brown Pride, which was initiated during the Chicano movement of the 1960s; with this skull we can see the connection between contemporary and traditional empowerment through the Latinx culture—contemporary in that it reflects a recent social movement for Chicanx pride and power, and traditional in that it reflects a long-established spiritualistic custom to convey the unity between the two very different, but still socially and culturally relevant ideologies. 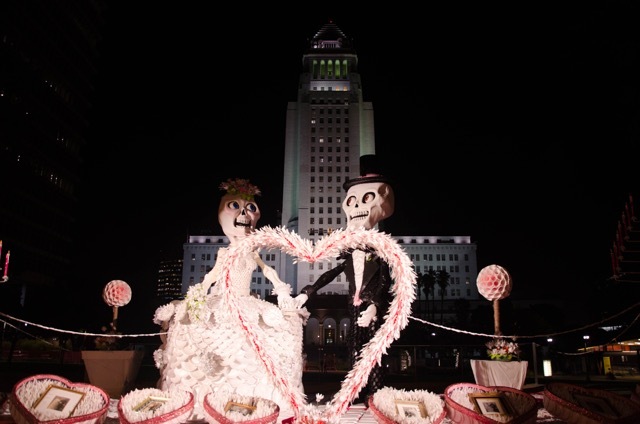 Apart from altares and calaveras, there was a large art piece entitled “Till Death Do Us Part…”—symbolizing the classic wedding chapel scene decorated in wedding glass boxes. This scene is meant to portray eternal love, as the bride and groom are elegantly dressed calacas. 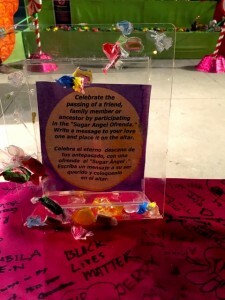 The materials used to create this artistic installation were re-purposed plastic—an ode to the notion and belief that love lasts a lifetime and that the spirits of our passed loved ones will always be with us. I have never felt so in touch with my culture and community; various men and women around me joined together by emotionally and physically engulfing themselves with the art exhibition. Witnessing the Altares at Grand park was an eye-opening experience. As Grand Park seemed to purposely place this installation of important aspect of Latino ritualism and culture within the heart of the city, it appeared to hold an underlying proclamation: the raza is present and we are not going anywhere.